Using strong passwords is a best practice to secure your online accounts. You might never know your account has been compromised until end of the story. So take preventative measures whenever you can, especially when it comes to security. My friends shared very helpful and easy to use tools for that matter. If you are thinking about it right now, head over to Barry's Creating and Using Secure Passwords With Ease and Adrienne's How To Access Your Passwords Easily posts to get started. Now it's not about using strong passwords I'm intending to talk here, neither how to stay away from suspicious content. Eventhough you have strong and unique passwords that no one ever would take a guess, still there can be security holes in services you are using to access your accounts. You can trust Google for that matter, but hackers never invite you to the party until you become a victim. Transparency always boost the trust among related parties. If we talk about transparency, Google is ingenious. If you know what I mean ;) Eventhough you considered all the preventative measures, how would you know whether someone accessing your account or is it only you? On Facebook you can notify if someone else accessing your account. Further, Google has an answer for you. For example you can see how many emails you have sent and received via Gmail, how many videos you have been viewing on YouTube and so on. It's suppose to reveal most of data that Google is tracking about you to result productive outcome. 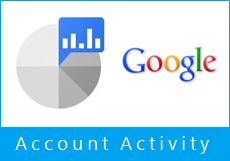 Google Account Activity provide users a monthly summary of their account activity across many Google products and services. It depends on the Google services you are engaged in. It helps users to identify what is going on with their accounts and trending actions. As Google depicts, the exclusive reason for this feature is to focus on users' account security. The best part is, it reveals the location, browsers and platforms you were using when you sign in for Google products or services. You already know I'm from Sri Lanka and I'm logging into my Google account via computer and smartphone. So here's what my account activity reports to me. I'm SAFE here. Likewise, you can take a look at yours and see if you have any suspicious information on the activity report. Let's say you are from United Kingdom and the report has multiple locations in addition to United Kingdom. Something fishy going on, eh? Unless you have shared your login credentials with someone else, you can take necessary steps to secure your account such as resetting password, but you have to wait for next month's activity report to confirm that no one else been accessing your account since the password change. You are required to login to your Google account before opt in to Google Account Activity reports. 1. Go to Google Account Activity page. 2. 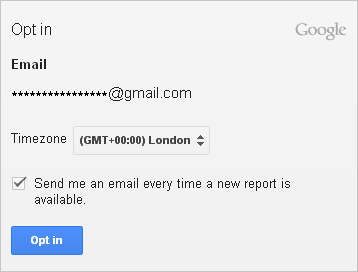 Set your timezone and opt in to Google Account Activity Report. 3. You will be notified when a new report is available for your account via email. * You may need to verify your password each time you navigate to Google Account Activity Report page because this service involves your personal information. * You can delete your reports at anytime. * If you think someone else has gained access to your account after reviewing your activity report, reset your password immediately. If you have no access to your account right now, submit a Google Account Recovery Form. Wow! This is fantastic Mayura! I'm definitely going to check this out. I have come to understand nothing is safe, truly safe in the Internet, so take all precautions necessary to keep my stuff as safe as possible. It feels nice when I know of some of the wonderful information you share on your blog, especially for me who is not much of a tech kind of a person. I discovered this long back when I'd visited another friend's blog. I guess all is well and safe with me because I have mine shared in 2 places - with me and my hubby, and it always stays like that unless of course, he isn't using his account. I like the fact that you can also get to know about your emails and YouTube details, so in a way you have it all in one place too. Something more Google users should read :) Thanks for posting it. I also use 2-step verification. I didn't know about this at all Mayura so I'd better go and check it out. I don't really use my Gmail account and my Youtube account is sadly lacking too but I've no idea if anyone else has been using them for something untoward either! That's easy enough to set up for sure, and it's so easy to be able to tell if someone has got into your account. Unfortunately, some people who have nothing better to do will always try to hack accounts that are not theirs, so we need to be protected. Thanks for this tip, Mayura. Thanks very much for this, Mayura - you've reminded me it's high time I changed my password for Google. I use the LastPass password manager, which makes it a lot easier to have strong passwords and change them regularly without too much hassle. Thanks Mayura, this is something to really check out. I had not checked it out yet. And I have several gmail accounts. That's great Mayura! I didn't know about that and really appreciate your informative posts. Thanks for educating us! I agree! :) Nothing's safe online though we believe so at some points. Well, I hope you will go through your account activity reports and find you are safe there. You know, access to Google account means access to all products / services lies within. Yeah Harleena, as I did most of 'em before the deadline I've got extra time :) But again, on it. I hope you would like to find out it's you're the only one using Google account :) You know, it includes your Google+ account too. Any one has access to your Google account has authority to manage products / services comes under your account. Aha... So you are not using Gmail much :) However I hope account activity report helps ensure safety of your account mate. Of course dear :) See, few steps and you are good to go. I agree there Sylviane. Hackers looking out for ways to spoil everything for someone, even it has nothing to do with 'em. Beware, 'cause sometimes rivals are there even you don't know about 'em. Now you can review report and take any actions if needed dear :) Prevention better than cure, right? I see you are very careful about the security of your online accounts dear :) Everyone should be. We can't predict when someone gonna hack us or if someone has access, he/she may use it for some other purposes too, nah? It's about personal data. Now Google Account Activity report will help you to know more about your account and you can make sure it's only you or not :) Else, we wouldn't know that, right? Aha... Several Gmail accounts mean several Google accounts :) You probably see your mobile browser in there as you always use mobile. Keep 'em updated Corina 'cause you never know what will happen next. Sometimes you may not be the primary target, but in the end, it might affect on yours too. Great safety precautions to know. I use double login for safety with my cell phone. A few days ago I got 5 messages with security codes. This meant that someone got my password and tried to break into my account. I did not know this at all. I'm going to definitely check this out. And I want to use Adrienne's suggestion for Lastpass too. Thanks as ever for more useful tips. information is key over net. Thanks Mayura, this is really awesome. I am glad to learn about this today and I did go to Google Account Activity and they emailed me the report. Awesome. Thanks Mayura for sharing this with us. Have a great rest of the week. Now I can see you already taken preventative actions to improve security of your Google account :) 2-step verification is a very helpful security feature. Yeah, it will ensure safety of your Google account dear :) You can check out for suspicious activities there. Strong passwords keep it more safe. So LastPass will be a good choice for you as you don't wanna remember passwords at all :) You can read about it at Adrienne's place. It's simple. Isn't it? :) Aha... So taking action rightaway! You don't wanna go there everytime 'cause you will get notifications when new reports available :) Simple as that.